The first bite of these chocolate brownies changed my opinion about this cakey treat completely. After a few rather dry, too heavy or painfully sweet experiences with brownies I already felt like giving up on them. 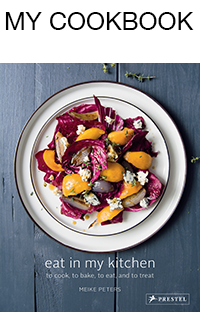 I never felt inspired and motivated to give them a try in my own kitchen but this recipe changed everything! They are fudgy, dense, chocolaty and juicy and a thin layer of sweet raspberry jam even adds a hint of fruitiness. 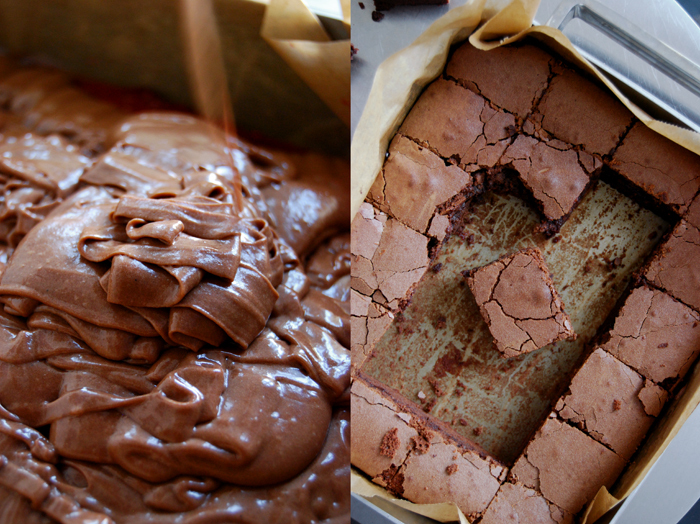 You can’t really ask for more when you pull a chocolate cake out of your oven! It’s important to use good quality chocolate, bittersweet, the kind you like to eat without putting it in a cake. Mine is 50% cocoa, I tried stronger ones but this works best for me. Sometimes I make the recipe without the jam layer which doesn’t effect the brownie’s fudginess, they just have to bake shorter as the fruit keeps the dough soggy for a bit longer. When I want chocolate, pure and intense than that’s my choice! I like both, so much that I always make a big tray right away, even if there’s just the two of us. I also like to make them for easy dinner parties, a sweet finger food dessert, no plates, just napkins and everybody gets a big brownie in their hands. This recipe comes from my boyfriend by the way. 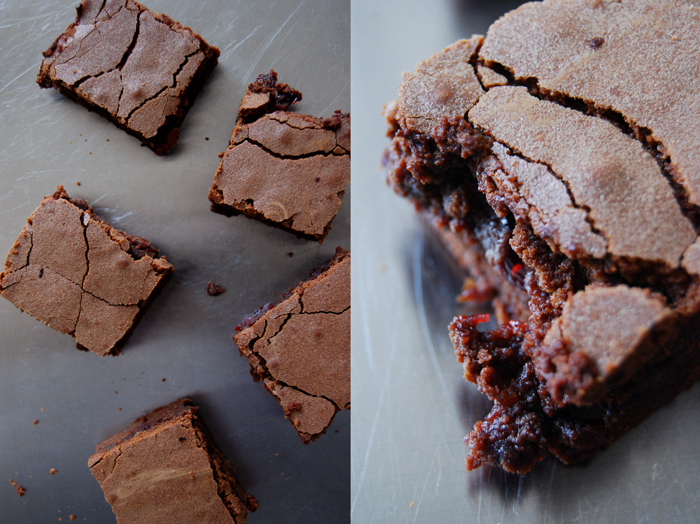 One day he went into the kitchen, came up with this recipe and baked these wonderful brownies. I don’t remember why or how, I don’t ask questions, I just enjoy them! Set the oven to 175°C / 350°F (fan-assisted oven) and line a 28,5 x 23,5 cm / 11 x 9″ baking dish with parchment paper. (It must be roughly this size). Melt the butter together with the chocolate and vanilla in a sauce pan. Set aside and let cool for a couple minutes. Beat the eggs together with the sugar till fluffy and add to the chocolate mixture. In a large bowl, combine the flour and salt, add the liquid mixture and mix with your mixer until everything is combined. Pour half of the dough into the baking dish, even it out and spread the jam on top, carefully so that the layers stay separate. Add the rest of the dough and spread evenly. Bake in the oven for 55 minutes. The top will be a pale brown and speckled. When you push in the middle you should feel a soft but spongy resistance. 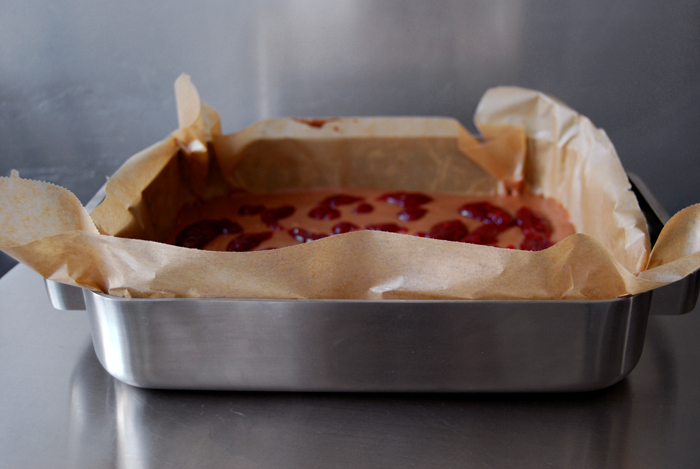 Let it cool for 10 minutes before you cut it into small squares. If you make the brownies without the jam layer, check them after 30 minutes. It should look and feel as described above. 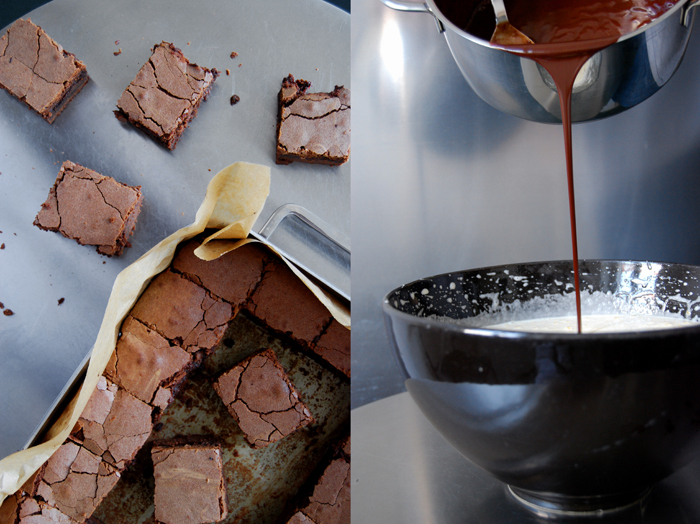 You can’t beat a good chocolate brownie and these look very good indeed! What a delicious treat, Meike. 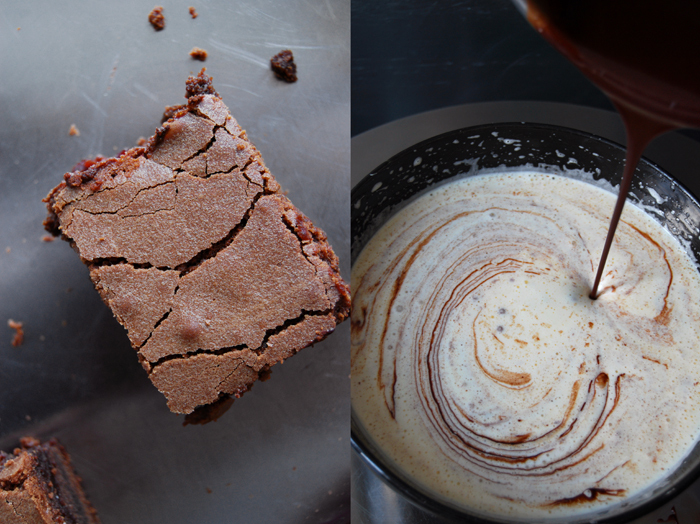 I am with you on brownies typically coming out cloyingly sweet. I am not a fan of those. But I am intrigued by this recipe! Also, raspberries and chocolate is one of my favorite pairings. I will definitely try these! I love them Mila! When you make them, tell me how they worked out! You have to take them out of the oven at the right point, neither too early nor too late. I checked them after 45 minutes but they were still too liquid inside so I gave them another 10 minutes. 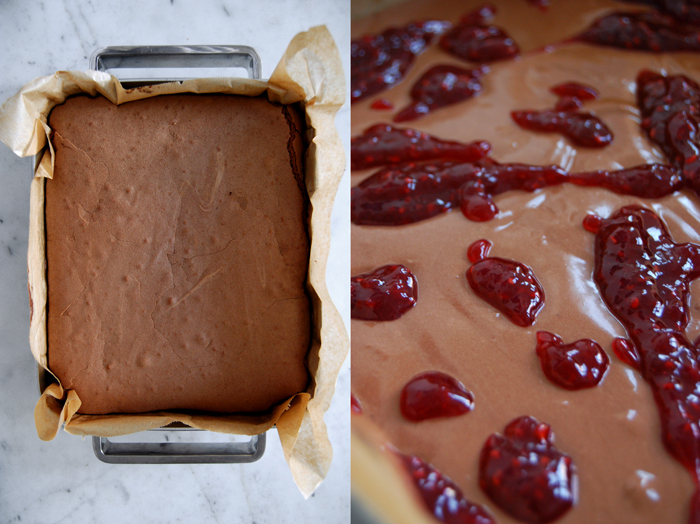 There is only one thing better than chocolate and raspberries…chocolate and orange. Those brownies look decadent and perfectly baked…I love them when the centers are gooey and quite dense.